I swam into this fascinating paradox early last year when passing through San Francisco and stopped by my favorite swimming hole at Aquatic Park to go for a short cold water swim. The water temp that day a balmy 53 degrees. I didn’t have a full wetsuit, but had my TYR swim skin sleeveless shorty (designed for temps above 78 degrees in triathlon). The veteran SF Bay swimmers of the South End and Dolphin Rowing clubs who swim frequently at Aquatics Park go without wetsuits regardless if temps are below 50 or above 60 degrees. The club swimmers generally scoff at the swimmers/triathletes with the expensive full wetsuits, but seem to tolerate them nonetheless. Rumor has it, if you join one of these swim clubs, they accept the wetsuit swimmer for a couple of weeks, then peer pressure sets in to shed your neoprene wrap and sport only your speedo, cap(s) and goggles. I’ve swam enough in the SF Bay, a cardinal rule is to keep your head warm (neoprene cap, tyr warmwear cap, etc) and wear ear plugs to keep cold water from rushing in and out of inner ear. Also, keep core warm, drink a warm drink, and stay warm head to toes before doing a cold water swim or swimming for extended periods in colder water even at temps in the low 60’s. Anytime I’ve swam in temps mid 50’s or below in a full wetsuit, it always stings a bit getting in, face, hands, feet hurt – and the initial seeping of cold water into the suit is a shock until the body heats it up. But after a few minutes, temps adjust and it feels very comfortable. I don’t like swimming in the full since the added buoyancy throws off balance and I need to adjust my stroke to a flatter “wetsuit stroke”. But I like warm too – so I’m OK with the buoyancy adaptation. However, after a cold water bay swim in the full wetsuit, my feet and hands would be completely numb. If I had to run to a bike transition in triathlon, I never got much feeling in feet and hands until I was well into the ride, often slightly numb until the run leg. Swimming several open water races that split groups between wetsuit and non wetsuit, interestingly, only swimmers wearing full wetsuits have been pulled out of the water due to hypothermia. Not one swimmer (in my experience) was pulled out going “skins” or no wetsuit. What is it about the wetsuit swimmer and non wetsuit swimmer, why would the swimmer with the neoprene body wrap, their body temp drop, and the non wetsuit swimmer body temp remain at 98.7 degs? Both wetsuit and non wetsuit swimmers had similar body types, mostly lean, not much body fat to spare. 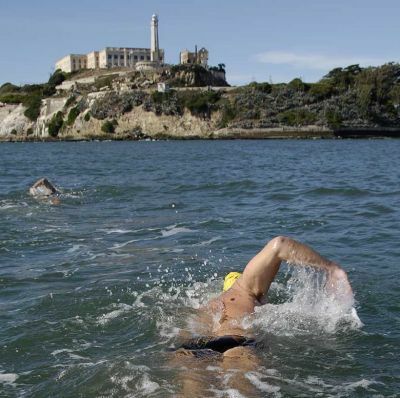 One swimmer most recently at the Bridge to Bridge swim (Golden Gate to Oakland Bay bridge) wearing a high end full wetsuit became disoriented, swimming in circles, and was pulled out due to hypothermia about an hour into the swim. All skins (non wetsuit) swimmers finished and several in 56 deg water for well over two hours. Jumping into 53 water in my sleeveless shorty speed suit, I’ll admit I was in pain. Face, shoulders, feet, hands all hurt – and cold water took my breath away. I hadn’t been in water in low 50’s for over a year and that was in a full wetsuit, no cold water acclimation. My initial thoughts were this swim wasn’t going to last very long. But as fast as the stinging cold set in, I was suddenly comfortably warm. No pain, warm, pleasant free swimming, no buoyancy adjust to a full wetsuit. I thought for a minute I was nearing death, but no – just kept on swimming comfortably for over an hour in low 50’s. Wow – this was a new experience I hadn’t expected. Is this what the swimmers at the local SF Bay rowing/swimming clubs have been trying to tell us? Running short on time, I had to get out – but sure didn’t want to. When my feet touched down on the sand, again to my surprise, I could actually feel the sand between my toes, no numbness. My hands, no stiffness, and fingers moved freely. This was a first after a cold water swim. Was I actually warmer swimming without a wetsuit? Does the wetsuit possibly turn off or mask the body’s natural defense to remain warm? I’m neither medical doctor nor physiologist, but I can’t help but be curious. But at least with my body and body type, swimming continuously in 53 degree water triggered a response to turn on a its natural defense to stay warm – through hands and feet too. What was the common thread for those wearing full wetsuits that went hypothermic? All of these swimmers, mostly lean men, balding, military hair cut or shaved heads wearing a thin single latex race cap, and no ear plugs. All the ‘skins’ swimmers however, had neoprene caps, and/or two thick caps and ear plugs – no hypothermia. But the “skins” swimmers seem to be much more aware of their bodies and spend time adapting to cold temps, where swimmers wearing wetsuits may have a false sense of security and skip important prep. Most heat escapes from your head. Regardless of what you have wrapped around your body, if your head is cold, your body will follow. Although many will argue, the surface area of the skull is far smaller than that of the body and more heat escapes from the larger surface area. This is true, but maybe it’s the larger surface (shoulders to toes) and stinging cold triggers the body’s response to turn on its natural thermal blanket. A. Warm core and keep body and head warm before the swim. B. Wear a thick swim cap (or caps), neoprene or warmwear cap. C. Ear Plugs. Keep cold water out of inner ear. D. Acclimate, slowly increase duration of each swim. With some simple preparation, regardless of colder water temps, you may discover that you shed the wetsuit altogether – and find a new sense of freedom in open water swimming and are no longer bound to a wetsuit and its added buoyancy. I am new to swimming and completed the basic Miracle Swimming program. I was thinking of getting a wetsuit vest when I swim/practice what I learned at my local gym pool but after reading your article I think I will just need a swim cap. I want to take my swimming to open water within the next 6-8 months. I will need TI lessons and that is on my To Do List.